Hello, hi, how ya doin' ? It's the start of a new year, clean slate & new resolutions. I have made a couple of goals for myself this year, as I am sure everyone does. I just hope I stick to mine!!! Searching the wonderful challenge blogs out there in cyber space, I found a few to play along in. I was recently a goodie bag winner at Simon Says Stamp and this adorable stamp set was in the box. 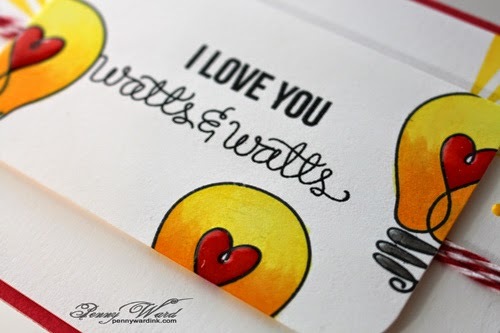 Such cute, cute sentiments to go along with the lightbulb image.!!! It's Friday and I want to give a shout out to a couple of new people visiting this blog. Thanks ever so much for taking the time to visit, follow and comment. I love reading what you have to say about my artwork. Great stamps and card design for the light challenge! love the colors you used! Gorgoeus gorgoeus gorgosu!! Love this Penny! Thanks for joining CASology!!!! I am a sucker for a good pun and this one really made me giggle! Thanks for playing along with CASology this week! A punny card! Your colouring is perfect! So glad you joined us at CASology this week! Such an outstanding card - love the cornered edges on only part of it - gives it a really cool look!! The colors are so dynamic together also!! 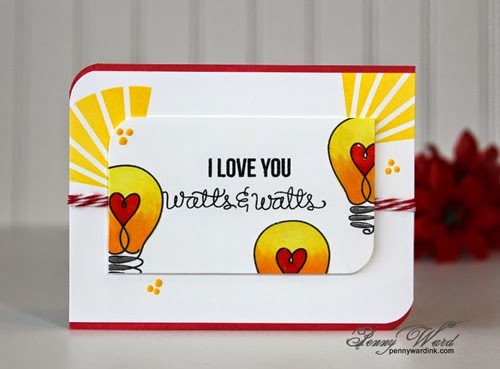 Love lightbulbs for some reason and this card just really appeals to me!! Great job - you did really good!! Adorable card! You did a wonderful job with that stamp set!! What a fun card! Very bright and cheery!